A detailed summary on Agile versus Waterfall project management differences is the highlight of this piece. Michael Sahotas main goal is to explain the key dissimilarities between the two, he does so in an organized and comprehensible manner. The Waterfall delivery approach aims to create documentation and plans that capture what is needed and the anticipated delivery dates, whereas the Agile technique focuses on delivering working software using an iterative approach. People collaborate as a group with regards to the Agile methodology, just like any sports team does. Their priority is to work and move forward as a cooperative unit in order to learn from one another and improve on previous designs, accomplishments and discoveries. Agile project management is considered a completely different mindset and culture due to this team-based system. In addition, software is delivered incrementally therefore providing more visibility and making delivery dates easier to predict. Those who proceed with Waterfall do so in a sequenced manner, often compared to a relay race. Normally, the end result is chaotic mainly because, as deadlines get closer or are missed, people abandon the documentation process so that they can rush to focus on what the end users really want – working software. 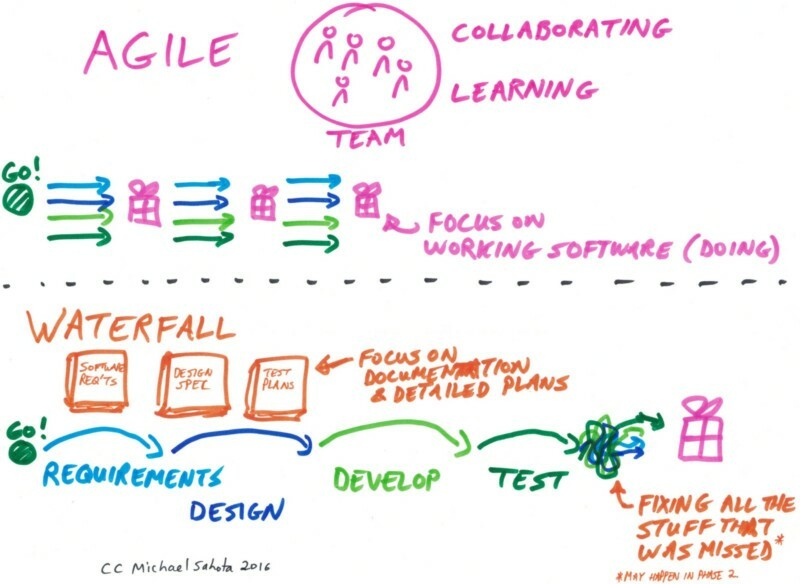 Agile versus Waterfall project management provides a visual representation of the inherent contrasts between these two radically different approaches to work management and software delivery. For more information on Agile versus Waterfall project management, click here.